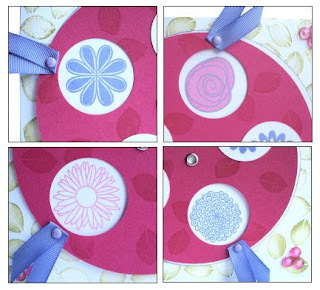 I used the leaf to make a background on this card then added stickles to make it stand out, I cut out 2 large circles one slightly larger than the other and punched out a circle from the smaller of the two, using versamark I stamped the leaf pattern all over this smaller circle to create a watermark then fastened both circles together with an eyelet. I punched out 3 circles from white card stock and stamped some of the flower heads onto these then arranged them on top of the rotating circle. 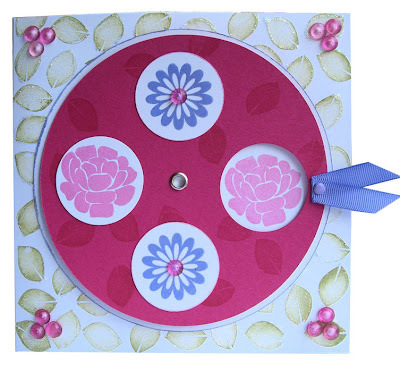 I then stamped through the hole I created all of the different flower heads and attached a ribbon to the side of the hole, this allows you to rotate the top circle to see the other stamped images, I stuck down the rotaing circle onto the main card then added berry accents and stickles glitter to finish. You can see from the shot below the other flower stamps in this set when the top circle is rotated they peek through where I punched out the circle. 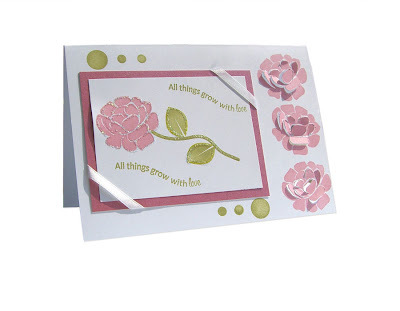 Using PTI Garden of Life Stamps I stamped 3 of the rose heads down the right hand side of the card then cut around individual petals and raised them slightly to add texture to the card, I then took the same stamp and stamped it onto a seperate piece of white card stock and added the stalk and leaves in a bamboo colour using the same ink and a straight sentiment from the stamp set I curved the sentiment to match the flower stalk, layered this onto matching card stock and added ribbon to the corners, Them using the centre of the flower circles I stamped these in the bamboo ink top and bottom to add contrast, used a little bit of stickles glue to finish. Amazing cards Jak!!! WOW!!! I had to pick myself up from the floor.